Mambo is a free, open source content management system (CMS) that is developed in the PHP scripting language. It is a dynamic CMS and uses the free MySQL database for storing data. 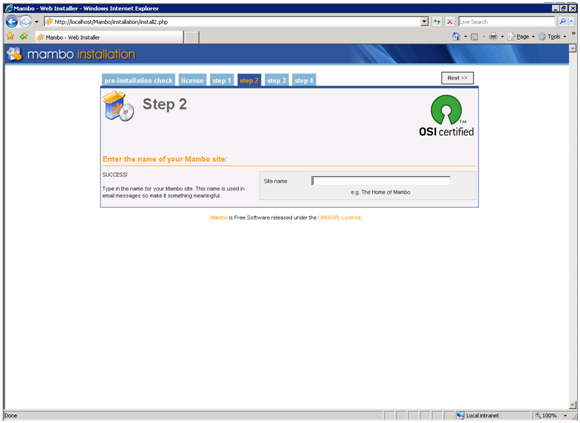 The following sections describe how to install and configure Mambo for use with FastCGI on IIS 6.0. 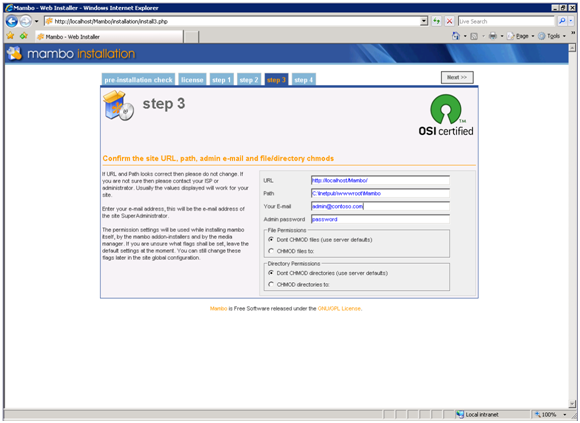 This document assumes that you have completed the setup and configuration of the FastCGI extension and PHP libraries as described in https://www.iis.net/fastcgi/phpon60. Download the latest stable release of Mambo. For this article we, use Mambo 4.6.2 downloaded from here. After downloading the zip package, extract its contents to C:\Inetpub\wwwroot\mambo or another directory of your choosing. Open your web browser and browse to http://localhost/mambo/installation/index.php. 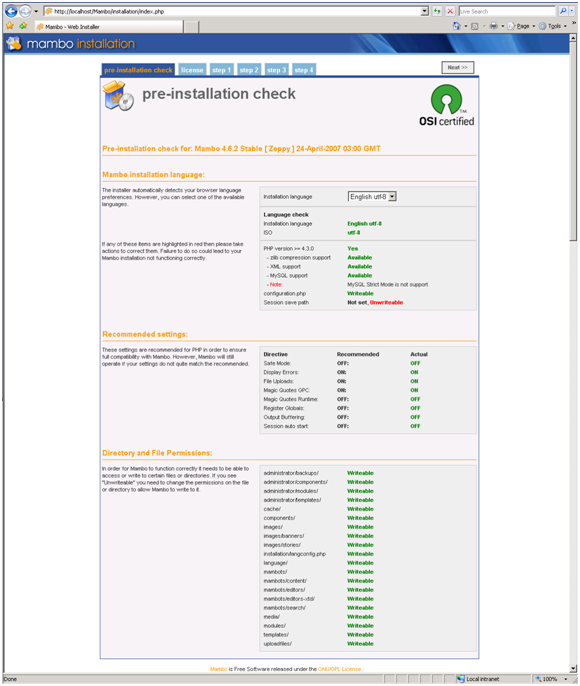 This takes you to the Mambo setup page, where you see the results of the Mambo pre-installation tests. When you have ensured that all the tests have passed, click "Next>>" at the top of the page. > [!NOTE] > You can safely ignore the Session save path at this stage. If it is not set, Mambo will still function. On the next page Mambo, asks you to enter the DB information. Enter the correct information and click "Next >>". > [!NOTE] > If your MySQL Server is configured to have strict mode enabled, then this step may fail. You must disable strict mode for MySQL in order for Mambo to succeed with the database setup. Enter your site's name. This is the global title of your Mambo-driven site. Enter a name, then press "Next >>"
In the next step, enter details for your site. 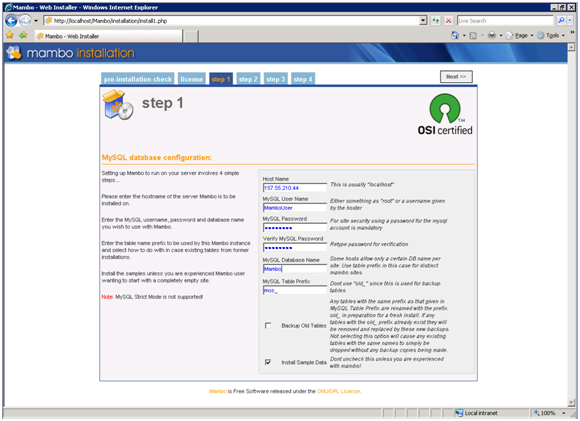 The URL should be set to the external sitename to ensure proper configuration. In a local test setup, the URL may have an extra Mambo at the end (ex: http://localhost/Mambo/Mambo). Enter your administrator email and password. The final two options should be left in the default choices. Press "Next >>"
> [!NOTE] > You must change the access permissions on the Mambo folder. Now that installation is complete, write access is not needed. Once the permissions have been specified, browse to http://localhost/Mambo/index.php for the "public" site, or log on at http://localhost/Mambo/administrator/index.php using the administrative username and password that you specified earlier. 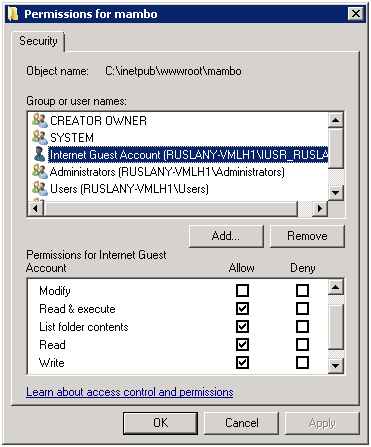 Open configuration.php file in the folder where Mambo is installed and set $mosConfig_sef= "1"
IIS.NET/ IIS 6 FastCGI forums.